I really enjoy the bright yellow of this card – all summery and fresh (if only we had the same weather!!!) I love the crispness of the white & yellow ribbon and crocheted flower – so cute. I haven’t bothered with a sentiment again – this card is now useful for any ocassion! Others: Brayer, wax crayon, Big Shot, Large Scallop Square Bigz Clear Die, Fleurettes II, Glimmer Brads, 1 1/4″ Striped Grosgrain ribbon, Rhinestone jewels. Here’s a photo of the LEGO biscuits I made for Ronan’s birthday last week – they’re a bit odd-shaped (and the icing is a bit dodgy), but hey, he’s nine and thinks anything topped with M&M’s is totally awesome!! Tee Hee. I think we can all agree that I won’t be going into the biscuit-making business. LOL. *laughs* At least they tasted alright. All I can say is; thank goodness the children are so forgiving! Ronan’s 9th Birthday LEGO card! Crikey! Our little boy turned nine last week!!! Poor Ronan has been sick recently – he’s had a bad run of tonsilitis, then a week later he had an upper respiratory chest infection and then just before he finished the antibiotics for the infection (and two days before his birthday), he suddenly came out in Hives!! All over. Litterally as I was watching, they were appearing. And so, hubby had to put our Pizza (Friday night Pizza and Movie Night!!) back in the oven so we could rush off to the local late night GP clinic. After a dose of Phenergan and Predmix, we came home, but within an hour he was asleep and missed the movie. He still had quite bad hives on his birthday and just wasn’t quite himself, but he was such a trooper about it and did the best he could. We had Gran and Nan over for lunch and cake during the afternoon and it was nice to spend the time together. He still came out in Hives yesterday quite badly but Phenergan works well. Because of how much he’s been unwell, I’d totally forgotten left it to the last minute to make his card. His birthday crept up on us!! He’s had two weeks off school due to illness and I just didn’t plan. SO…. at the last minute, and because he LOVES LEGO so much, I did a quick search for Lego card ideas… the inspiration for my card comes from Marelle Taylor‘s wonderful Lego card. To make up for his not-feeling-so-great-birthday, we took him and two friends to see Ice Age 4 yesterday which was good fun! I used the Stampin’ Up! current Idea Book & Catalogue as inspiration for this card. Check out page 72 and you’ll see a card in the top left that uses a different stamp set (Every Moment), but I quite liked the design and layout of the card and just tweaked it somewhat. I love the combination of the Vintage Wallpaper embossing folder with the antique feel of the stamps. This little set is so cute. I love the butterflies – and they’re not that hard to cut around. The 3 butterflies are the on the one stamp so it’s easy to get them in a straight line if that’s what you want. The sentiments are practical too. Other: Big Shot, Vintage Wallpaper embossing folder, Dotted Scallop Ribbon Border punch, Lots of Tags Sizzlits die set, Extra Large Oval punch, Chantilly Crochet Trim, Vintage Trinkets (safety pin), Stamping Sponges, general shipping tag. An Oak for a Bloke. This is a card I made after a school-mum friend asked if I had any masculine birthday cards in my “stash” that she could buy to give to her husband… I really don’t make many masculine cards – I tend to make them as I need them. I don’t know about you but I struggle with masculine cards. Lovely as a Tree is a set that I don’t pull out that often but I enjoyed having a play around with it to create this card. Anyway, I didn’t have anything suitable and although she said not to make one especially, I just *had* to. LOL. And besides, it was a good challenge. This isn’t her exact card (I didn’t get to photograph it in time), but it’s similar to this – on hers I used some retired Earth Elements buttons in More Mustard, Pumpkin Pie and Old Olive to tie in with the inks used on the tree, and I also used a retired Rub-on sentiment, but otherwise this card has the same colours, general design, stamp image (the Oak tree) and technique to colour the image. This one has the ribbon and bow whereas on her card I used the buttons instead of the ribbon as en embellishment. You’ll notice that I haven’t put a sentiment on this card – I didn’t forget it; I left it off on purpose – now it can be used for almost anything masculine-y. (Is that even a word???) It could be a thankyou card for a bloke, a birthday card, or thinking of you card. See, I’m not totally useless – now I’m “prepared for anything! !” If I really wanted, I could stamp a sentiment and use the Modern Label or Word Window punches to cut out the sentiment and the adhere it in the bottom right corner. Ta Da! -instant card; ready for anything. A little bit of a Twist. Using my much loved Apothecary Art stamp set and matching Big Shot Framelits – Labels Collection, here is a Twisted Easel card. I hope it has a clean and fresh feel to it, at least I *think* it does anyway. Here is the whole set for Apothecary Art – it’s really versatile, and while it’s PERFECT when you match it with the Framelits Labels Collection die, you can easily cut these images out by hand. This is the Loving Thoughts set. I used the “Wonderful You” sentiment for my Twisted Easel Card, above. 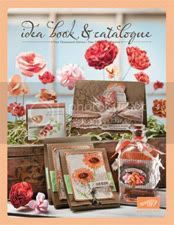 Other: Big Shot, Framelits- Labels Collection, Finial Press embossing folder, Certainly Celery Satin Ribbon, Boho Blossom punch, Basi Jewels Rhinestones, Snail, Dimensionals, Sticky Strip. Thanks for visiting – have you stamped today? Here’s a card that I made with a fabulous technique called, “Crayon Resist”. I demonstrated this technique (not this exact card) at a recent Workshop and it’s really fun to play around with different images to see how they end up. I’ll post the card that I demonstrated with the same technique at later date. You’ll need to use Glossy White cardstock, Black Staz-On ink, a normal wax crayon (raid the kiddies pencil case for that! ), a tissue, a brayer or sponge and of course the inks of your choice. Start by stamping your chosen image onto Glossy White cardstock with Staz-On ink (be careful not to push too hard or you’ll be skating all over the cardstock as it’s quite slippery!!) I set this aside to dry a little and you can use this time to complete the rest of your card while the Staz-On is setting. Once the Staz-On is dry, you can use the wax crayon to colour-in the areas that you wish to remain white (in this case, it’s the tree trunk and leaves). I used my brayer to roll ink over the image, starting at the bottom with the lightest colour first. Continue with the next colour and the next. Once this is done, (I let my ink “settle” for a little bit too) you can use a normal tissue to gently rub over the stamped image and rub off the crayon – leaving a pretty effect on your cardstock. If you don’t have a brayer you can use a sponge cut into wedges to rub (in circles) over the cardstock until you get the depth of colour you’re happy with. Here’s another card I made at the same time with the Lovely as a Tree set. I don’t even mind that the white areas are a bit “chunky”; I like to think it adds to the rustic feel. *laughs*. I made a gift tag to go with the card too, quick and easy! Other: Brayer, Wax Crayon, So Saffron Taffeta ribbon, Designer Buttons (Brights), Pink Hearts edgepunch, Linen Thread. Bordering on Romance – Bordering on Beautiful. This set is so pretty. *sigh*. And it’s so enjoyable to colour in too. Here, I’ve used Blender Pens and ink pulled form the lids of the ink pads. Now it’s not just the children who can enjoy their colouring-in – you can too! I believe that even though the Blender Pens are used, that this is also called Watercolouring (which is weird ‘cos we’re not actually using water. LOL) I think it’s to do with the finished effect. Don’t quote me on it though or sue me, okay? Don’t forget that you can use the VersaMark ink pad to use as a background colour on your cardstocks. You’ll notice the faint flowers on the Baja Breeze cardstock – that’s done with a VersaMark Pad. This is a little gift card that I made with the Owl Punch – isn’t he a cutie-pie? You could make a whole stack of these in one night and use different sayings for different occassions and be prepared for anything! Also, can you see the faint woodgrain pattern on the background – it”s made with the Woodgrain background stamp which I’ve stamped in Crumb Cake ink onto the Crumb Cake cardstock to create a tone-on-tone effect. Very nice. Join Stampin’ Up! in your way . . . with our completely customisable Starter Kit for just $169! Build your own personal kit by picking $235 worth of any of our high-quality products. We’ll add in a business supplies pack valued at $80 (to help you get your business up and running) and you’ve got a customisable kit valued at up to $315! I’m not kidding – now it’s even easier to get the products YOU love and can’t live without. No longer do you have to make a selection from a pre-determined (and yet still AWESOME) range of products, you can select any of Stampin’ Up!’s TOTALLY AWESOME products up to $235 (no more) and PAY ONLY $169! And let me tell you I’m SO excited about some proprosed changes with the catalogues! Great things are happening! Stampin’ Up! will release two seasonal catalogues, comparable to (but larger than) the current mini catalogues. The annual catalogue will be increased from 168 pages in the current Idea Book & Catalogue to 204 pages!! WooHoo!!!! Please note: the upcoming annual catalogue will last for ten months, and will end on 30 June, 2013. The reason for these changes are to eventually align our catalogues with the American catalogues so that the release dates are more in tune with each other. YAY!!! So if this sounds like something you’d like to jump on board with, contact me and I’ll help you make it happen! Stampin’ Up! is a fantastic company and has fantastic products that I fully recommend and LOVE!!! We have an AWESOME team of support staff that are only a phone call or email away and there are always PLENTY of specials and promotions and GREAT deals that we can take part in too. Join my Team! Become a Demonstrator! 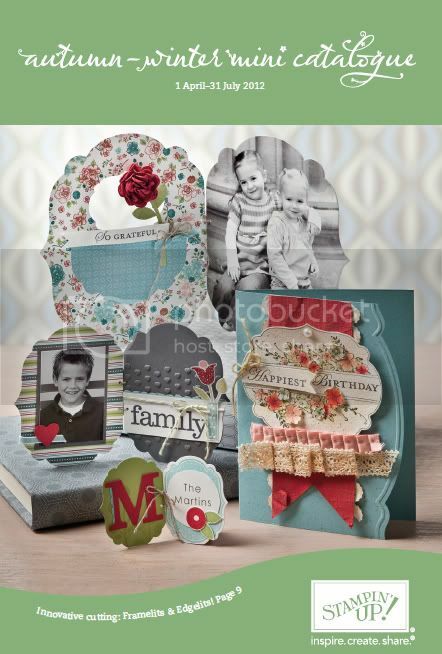 Receive my Stamping & Paper-craft Newsletter!